We will save a new entry in our system because we just bought it and will store it in the fridge for later. If we change the location the system only knows about that location. We want to keep a history of everything we drank. I want to know when I drank this in my history. But that’s only for new beers. Removed Location and changed name because in the real world you might not know this yet. And at last a event about when I consumed it. Crud ● ● ● I know what beer I have. I know when it was consumed. I know where it is. Event-Sourcing ● ● ● ● ● ● ● ● ● I know what beer I have. I know when it was consumed. I know where it is. I know where it was before. I know when it was moved. I know where it was at any point in time I know how many times it was moved. I know when it was added to the system. I know what else was moved in that day. How many beers do I have? How many different styles do I have? How many beers have I drank last 30 days? A Projection allows you to loop through all event (past and present) and build your own views. ● Read Model ○ ● Projection ○ ● Define the data you would like to use. Loops through the events and applies that data to your view Finder ○ Helps you find data from that view. But what if I have like 100 trillion gazillion events? 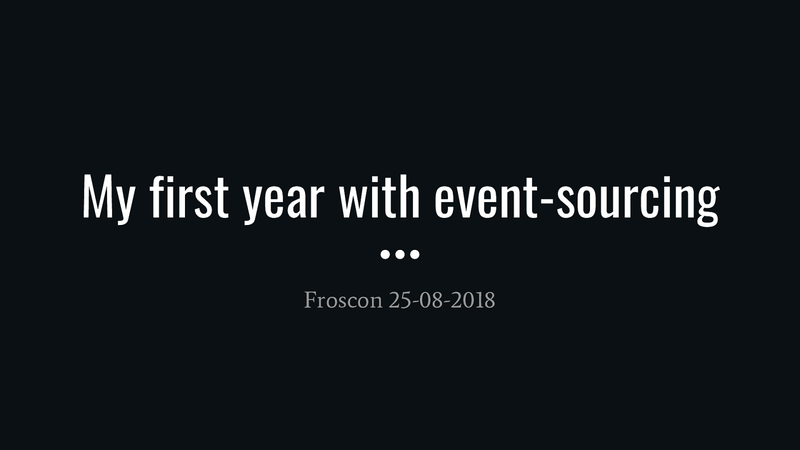 View My first year with Event-sourcing on Notist. Over the last couple of years, I have heard of Event sourcing but did't really know where to start until I did a tutorial at DPC '17. After having some basic information it was time to start a Hackathon and after that something production worthy . In this talk I will try to give the best information to get started and to know some of the problems you can face if you begin event-sourcing. Tim puts presentations on for free. You can too.